The perfect blue water sailboat is a work in progress. Novice builders and beginning yacht designers have been trained in the US to accept the notion of a trade off between sea worthiness, comfort, performance and cost. April 4, 2016 in Evaluation, Racing. High freeboard improves buoyancy with no decrease in hull speed. 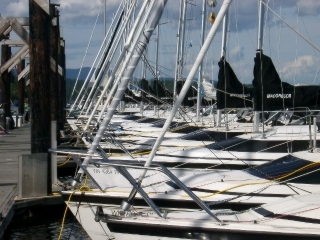 Sailboats at rest with low freeboard only look faster than many of their high freeboard counterparts. Unless the boat has the general shape of a log, the heel of the vessel increases the freeboard presented to the wind. July 28, 2014 in Design. The competing hull forms in Murrelet (displacement in the bow and planing aft) bring up some interesting aspects in sailing the cruiser. Because the manufacturer built so many pocket cruisers, the best hull form and ballast configuration was extensively studied. June 4, 2014 in Design. Boats can be split into two categories: the ones that dig holes in the water and the ones that travel on top. Race boats, runabouts, fast cruisers, sport fisherman and military patrol craft are part of the planing fraternaty. June 1, 2014 in Racing. I’ve seen people discussing liferafts and such, but for me this big issue here is keels. The four crew on Cheeki died because the boat’s keel fell off, probably very suddenly, and this is not, as some have suggested, an unusual occurrence. April 7, 2014 in Ex Ex 2014. Joshua Slocum was from Nova Scotia, Canada. He owned several ships as well as commanding many others. After loosing one of his ships, the Aquidneck, on a sandbank in Brazil, he and his family sailed the Liberdade, a canoe of about 35 foot, from the site of the grounding to Washington DC USA, his new home. March 29, 2014 in Ex Ex 2014. 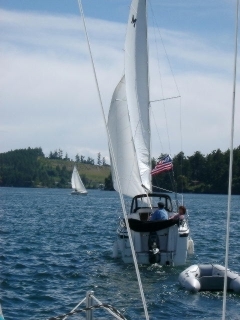 I’m occasionally asked if I miss the larger, deep draft sailboat. The answer is always no. That type of craft now seems to me like a helpless one-legged seabird soaring above the surface of the sea, never able to safely land or seek shelter. March 24, 2014 in Ex Ex 2014. “Unfortunately, the speed range for typical displacement boats between 20 and 50 feet is only five to 10 knots- not nearly enough for many recreational roles. True, slow moving, full displacement vessels are reasonably efficient at carrying heavy loads because buoyancy forces sustain the weight for free, and only modest engine power is needed to slide it along. March 22, 2014 in Ex Ex 2014.